The Malleefowl, a turkey-sized mound building bird of the drier parts of Australia, is a widespread but uncommon bird living in the region where I live. It is primarily a ground dwelling bird, feeding mainly on seeds. The male makes a large 2 to 3 metre wide mound of sand and vegetation like leaves, grass, bark and so on which acts like a compost heap. The rotting vegetation develops heat which incubates the eggs the female lays and buries in the mound. The male works the mound daily during the summer months, adding or removing soil to regulate the temperature in the egg chamber. Not surprisingly, this bird is also known as the Incubator Bird. In all my years of birding I have only seen about a dozen of this species, but amazingly, I saw 6 in a one hour period. The bird in the photo above is a captive bird in the Adelaide Zoo. As we were travelling towards Mildura for the night on the second day of our journey home, we saw the sign for a rest area ahead. It was called the Malleefowl Rest Area. We just had to stop there for a break and a cuppa. The large sign (see photo above – click to enlarge) had plenty of information about the Malleefowl for non-birding members of the public. I felt it was a great way to educate the general public on the wonders of this amazing bird. The rest area is set just off the main highway and in the midst of typical mallee country – see the photos below for several views from the picnic table where we had our cuppa. Sadly, we didn’t see a Malleefowl, here or along the road on the way to Mildura. It would have made a wonderful addition to my Trip List of birds. 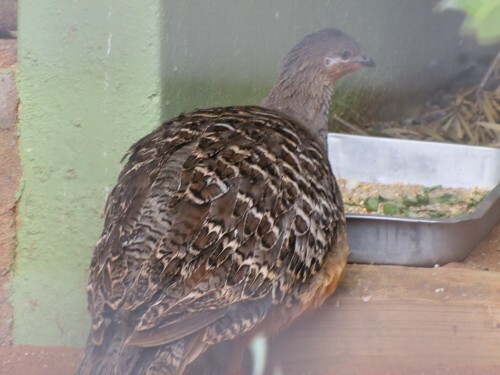 In this week’s local paper, The Murray Valley Standard, there was a disturbing article about the imminent demise of the endangered Mallee fowl, once a relatively common bird in our district. In over 25 years of intensive birding in the district I have only ever seen two birds, both together. While I’ve found about five nesting mounds, only two of them are still actively worked by the birds. Local experts are predicting the complete local extinction of the species in my area within 5 years, a sad thing to contemplate. You can read the whole article, which includes photos, by clicking here. One of the most recently active nests at Ferries McDonald Conservation Park, is shown in the photo below. This park is a half hour drive from my home. While the bird is reasonably secure in some other parts of Australia, local extinction is a worrying trend and is being mirrored elsewhere, hence the endangered status of this amazing bird. The Innes National Park at the southern tip of Yorke Peninsula is one of the more reliable places to see the endangered Malleefowl. On our recent holiday there I didn’t manage to see any, but I was delighted to get some good photos all the same. The birds I’ve shown here on this post were stuffed birds on display in the park Visitor Centre! I have seen this species here on previous visits many years ago. A friend of ours used to have access to some non-public roads so he could set up his beehives in the mallee which is the predominant tree in the park. Allan was able to set up his 8mm movie camera and film the male malleefowl working at the nest mound. One memorable scene showed him scratching at the dirt with the male bird alongside busily scratching the dirt back onto the mound. Malleefowl males make a nest by scratching earth, leaves, sticks and other vegetation into a mound, often 2 – 3 metres across and 1.5m high. The vegetation then rots, just like a compost heap, and the heat produced hatches the eggs. The eggs are placed in the mound by the female, often laying 20 – 30 eggs over the spring and summer months. The male then tends to the nesting mound, keeping the temperature at a constant level by adding more dirt, or removing it. On hatching, the chicks dig their way out of the dirt and then run off into the bush, tending for themselves from the first day. Yesterday I wrote about the mural painted on the side of a classroom at Pinnaroo Primary School showing a Malleefowl and its nest. A few days later I visited Tintinara in the south east of South Australia. Right in the main street of the town there is a Malleefowl’s nest with two birds tending the nest. Before local birders race off to visit this “nest”, let me assure you that it isn’t a real nest; it’s been put there to simulate a real nest. And the two birds are metal cut outs in the shape of the birds. It’s located on the lawn in front of the Art Gallery and Information Centre which happens to be the old railway station building. The nest looks realistic and so do the birds – if you just look at the outline shape. I think it would have been improved if an artist had painted the birds in their correct colours. I guess for consistency they’ve left them just as a shape, in keeping with the metal cutouts of a shepherd, a sheepdog and some sheep across the lawn and little. It was only a short distance to the west of here that I once saw 6 Malleefowl in ten minutes, doubling my lifetime count of this species. You can read about that incident by clicking here. Below I’ve posted some photos of the shepherd and his sheep.